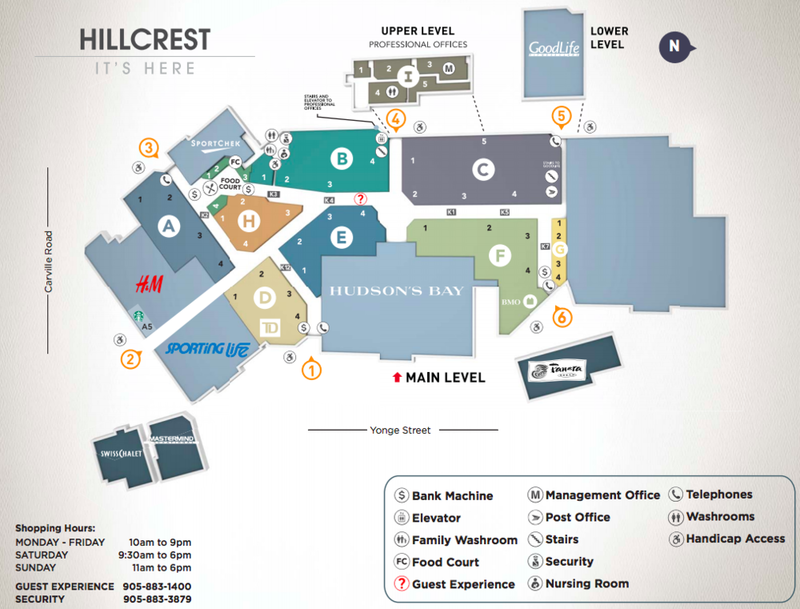 Hillcrest Mall, located in Richmond Hill, north of Toronto, is a unique enclosed shopping centre that is undergoing a remarkable modernization. The following is an overview of the centre’s past, present and future. And the centre’s future is bright — Landlord Oxford Properties recently announced that Hillcrest Mall will be redeveloping its 133,000 square foot Target space on its north side, by adding a new corridor as well as several new retailers. In the fall of 2018, Marshalls and HomeSense will open a combined retail store spanning 46,450 square feet, and there’s more on the way. The redevelopment will feature an exterior mall entrance with soaring ceilings and bright lights, similar to the mall’s Entrance 2 to the south, which is part of a recent redevelopment that saw the addition of a beautiful Sporting Life store in October of 2016. The mall’s interior is also seeing a refresh, including new floors, lighting, washrooms, ceilings, and an upgraded food court. 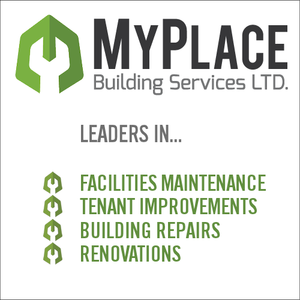 The men’s and women’s washrooms, including the foyer and parents room, have just been revamped. It’s all part of a major investment on the part of owners Oxford Properties Group and Montez Holdings Inc., with close to $100 million being spent since late 2015. Several retailers have recently opened, and more are on the way. This fall, Rockport and Escents Aromatherapy opened at Hillcrest, and Sleep Country Canada unveiled a 5,000 square foot space in the mall. This fall, children’s retailer Okaïdi will join Browns Shoes and not long after, Chinese variety retailer MINISO will open a 2,600 square foot store. In the spring of 2018, West Coast Kids will open a 13,000 square foot location. Hillcrest’s food court is also being completely redesigned, in partnership with MMC Architects. In the fall of 2016, Hillcrest Mall opened several world-class retailers, including a 21,000 square foot H&M store, a 6,600 square foot Aritzia, a 4600 square foot Sephora store, as well as jeweller Pandora. Popular Toronto-based Sporting Life, known for merging fashion with sporting goods, opened a 40,600 square foot store which sources confirm is a very strong performer for the chain. The mall’s Hudson’s Bay store, as well, underwent an overhaul and expansion that involved merging two smaller Bay stores (separate women’s fashion and home/men’s stores) into a bright, modern 136,915 square foot retail space that reflects the design of Hudson’s Bay’s Toronto prototype Queen Street flagship. What’s interesting is the men’s department at Hillcrest’s Hudson’s Bay store is one of its top selling departments — typically, women’s categories tend to dominate. 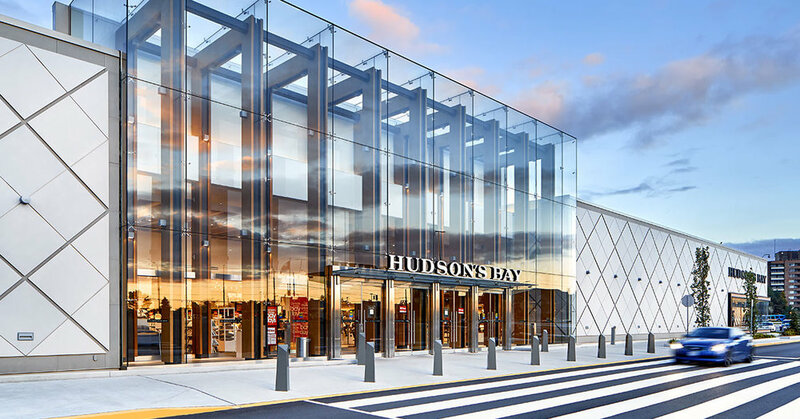 Hudson’s Bay gained about 48,000 square feet of space in the expansion, including a new glass-enclosed entry facade, fixtures and open sight-lines through the store. New upscale brands such as Coach, Marc Jacobs, Vince Camuto and Ron White were added in various categories. The future is also bright for the local community — affluent Richmond Hill is expected to grow to about 209,000 people by the year 2021, according to York Region Planning & Development. The average household income in Hillcrest’s trade area is $122,420, and 47% of households earn over $100,000 annually. The immediate area will also get a boost with an estimated 8,800 condominium units being built around Hillcrest over the next several years. By the numbers: Hillcrest Mall features 503,581 square feet of gross leasable area, with about 120 stores. The mall sees about 6 million annual visitors, with sales of $530 per square foot in September 2017 – a 9% year over year increase. 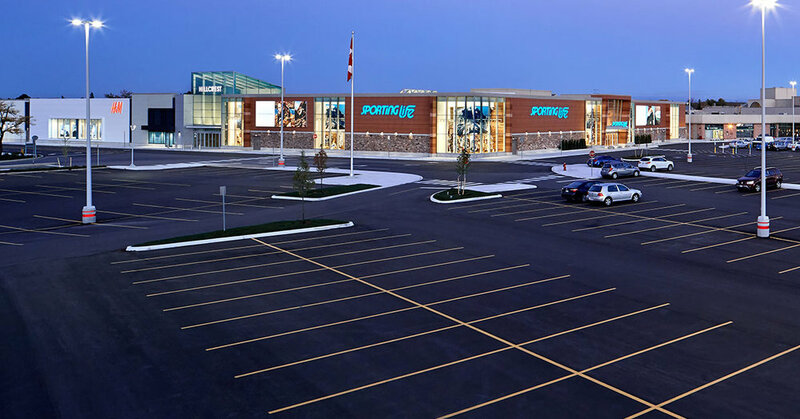 Aesthetically, the centre’s exterior feels modern and comfortable — the recently paved parking lot (with 2,631 spaces, with 4 electric car charging stations) features attractive landscaping, and the exteriors of Hudson’s Bay, Sporting Life and other retailers are eye-catching. There’s another exterior element that isn’t as visible, however — on the roof of Hillcrest Mall is a collection of beehives with more than 70,000 honeybees, which have helped pollinate local flowers and vegetable gardens — a bonus for Richmond Hill’s biodiversity. A single hive can produce more than 20 lbs of honey, and in August of this year the mall bottled and branded its ‘Hillcrest Honey’ that was given away at the mall’s pop-up Honey Concept Market in the mall’s Centre Court in September. Additionally, 100 bars of soap, created from Hillcrest honey, were donated to the Yellow Brick House, a local women’s shelter. -Hillcrest has stopped planting annuals and has moved on to native perennials, planting them all around the mall — no doubt, the bees are enjoying this as well. Hillcrest Mall opened in August of 1974 and at the time, it was considered to be groundbreaking. Cadillac Fairview and the Greater York Group were the developers, while Bregman and Hamann executed the architectural drawings, and Robert Meiklejohn coordinated the interior design. At the time, light pollution was a concern so there was minimal signage, as well as shielded lights in the parking lot that also featured a light-absorbing parking lot surface. Anchors at the time included Simpson’s, Kmart, Sears, and a Loblaws grocery store. 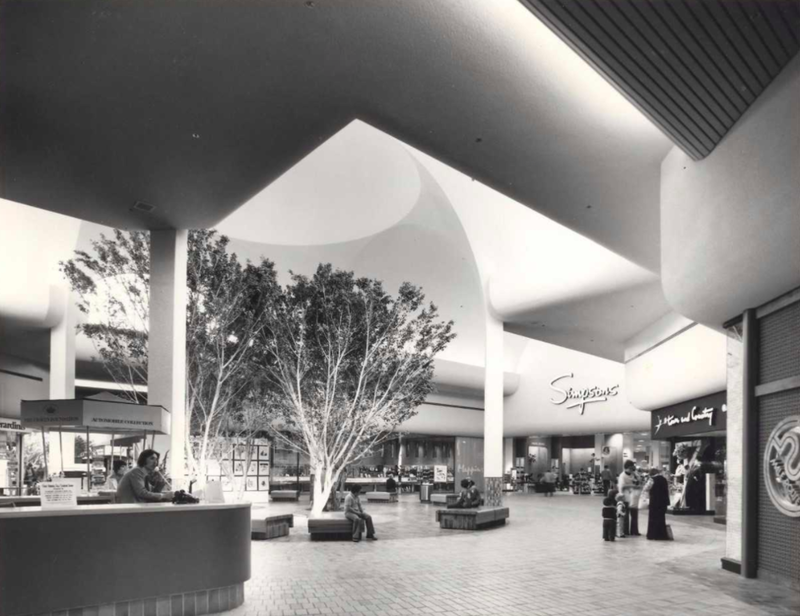 The mall was essentially the same size at it is today, spanning about 540,000 square feet. Flowers played a role in the 1974 opening — the first 10,000 Simpson’s patrons received a rose, which was a nod to Richmond Hill’s past as being the rose growing capital of Canada. In the central square (see photo), four ficus trees imported from Florida were planted under the sunlit vaulted ceilings, while the food court featured picnic seating and gaslight lamps. 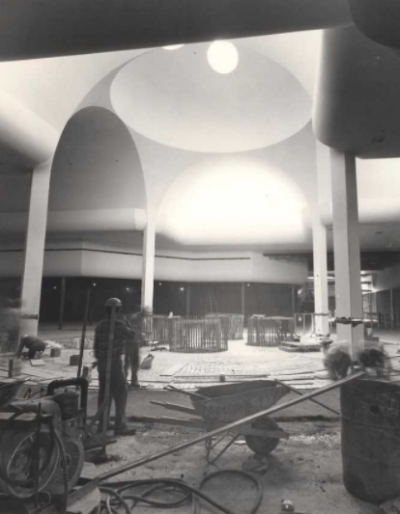 There was also a 250-seat auditorium with a stage and a kitchen that could be used for local events, including fashion shows — we’re seeing a return of such features in malls, as they become entertainment centres today. In 1980, a five-screen, 519-seat Cineplex movie theatre opened in the mall where Goodlife Fitness is now located. The Simpson’s store was rebranded as Hudson’s Bay in 1991, coinciding with parent company Hudson’s Bay’s decision to discontinue the Simpson’s nameplate. Zellers opened in the Kmart space in 1998. Oxford Properties purchased the property in the spring of 2011 and when Target vacated its space in the spring of 2015 (coinciding with Target vacating Canada), the lease was acquired for the redevelopment discussed above. Looking to the future: There’s still more work to be done on Hillcrest Mall after its Target space is redeveloped, and landlord Oxford Properties will be announcing further changes as things progress. We’ll update this article with news on Hillcrest Mall in our Retail Insider Briefs throughout the year, which will now be a regular feature as part of Retail Insider’s reporting mandate.